Recently I’ve bought a lipstick that isn’t very common for me in common as a usually prefer bright colors. 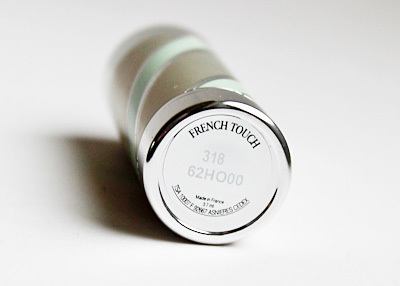 This one is very delicate and sheer — Lancôme Le French Touch Absolu Nu from Spring 2012. Le French Touch Absolu Nu — is to be the same sheer and moisturizing formula as in common L’Absolu Nu, but the packaging is different (I’d say simpler). To say the truth I don’t find neither old nor new lipsticks moisturizing, but they don’t dry my lips and can be applied smoothly. 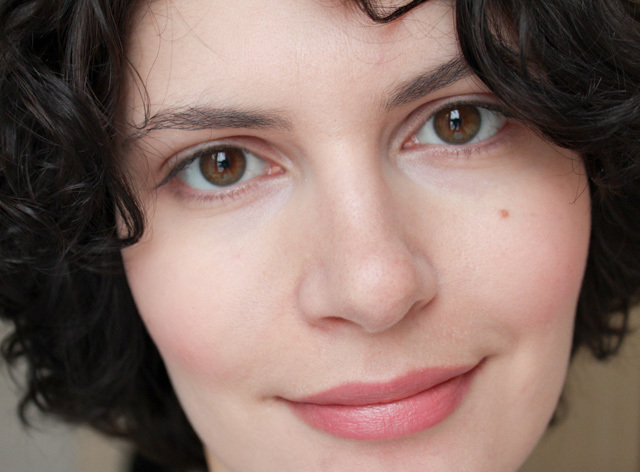 This spring lipstick doesn’t last long — 3-4 hours assuming you won’t eat or drink. For this I blame the light color and sheer formula, but for me this is not a big problem. The problem is that if you have dry or peeling lips the color will gather around drier areas and will outline all imperfections. 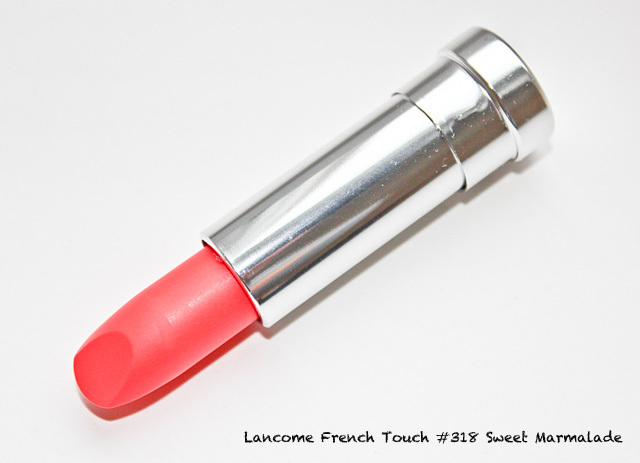 #318 Sweet Marmalade is a sheer color with a bit watery finish and no shimmer. It is very delicate, very spring color. I don’t usually wear such colors and the closest I could found in my case were Rouge Automatique #143 Nahema (looks somehow alike until you start to swatch them) and Maybelline Colorsensational #445 Mango Diamonds. 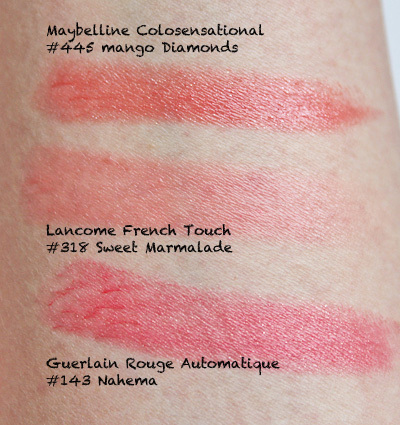 It’s curious that some bloggers name only one lipstick shade in Lancôme spring collection. Temptalia named tow and Karla Sugar showed three. I’ve seen three colors in Sephora stores. Availability: at your local Lancôme counter since January. Price: 29.50$ for 3.7 gr. 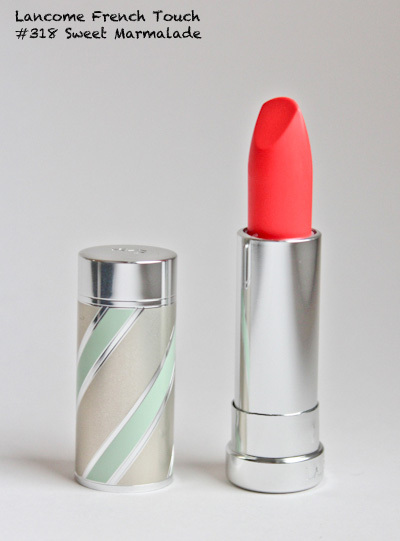 Final Thoughts: you will like this lipstick if you want sheer formula or if you generally prefer lip glosses. The problems are — doesn’t last long and tends to show you dry and peeling lips. The color is nice and sweet, but a bit dull as for me.